Home of your favorite train, locomotive, and other rail related photos since 1998! There are currently 217,043 photographs available in the archive. 0 so far today, 15 yesterday, and 85 in the last week! Southern Ry. 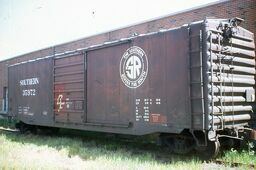 box car at B&M customer siding in Cambridge.